Australian Juice bar business Boost Juice has entered into a new marketing campaign with Bega to bring the country a Vegemite flavoured drink. 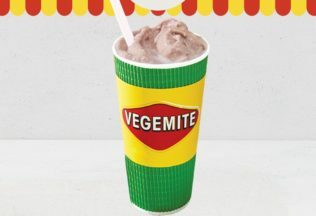 The Vegemite Boost is a smoothie that combines chocolate, vanilla yoghurt, banana and a hint of Vegemite. Claire Lauber, managing director of Boost Juice is excited to bring this unique and never before offered smoothie flavour to the Australian public. “Vegemite really is a quintessential Australian favourite that many of our customers grew up with, “she said. The Vegemite Boost will be available in boost stores nationally from 4 June 2018 to 1 July 2018 as part of Boost Juice’s new ‘Aussie Milk Bar’ range which also includes other Aussie classics such as rocky road and cookies and cream. Bega Cheese’s $460million acquisition of food giant Mondeléz International’s Australian and New Zealand grocery and cheese business in 2017 included the Vegemite brand. The Vegemite brand has a history spanning over 90 years. Its story began in 1922 when the Fred Walker Company, which would later become Kraft Food Company, hired a young chemist to develop a spread from one of the richest known natural sources in the Vitamin B group brewer’s yeast. The founder of Boost Juice Bars, Janine Allis, noticed the fad of the juice bar when on holiday in the United States in 1999. In 2000, Allis opened her first Boost Juice Bar in King William Street, Adelaide while she was on maternity leave. Primo is now selling a new range of premium deli meats. Bulla is now selling two new stick ice cream varieties and one new ice cream tub flavour.